Great Value Without The Food Coma! 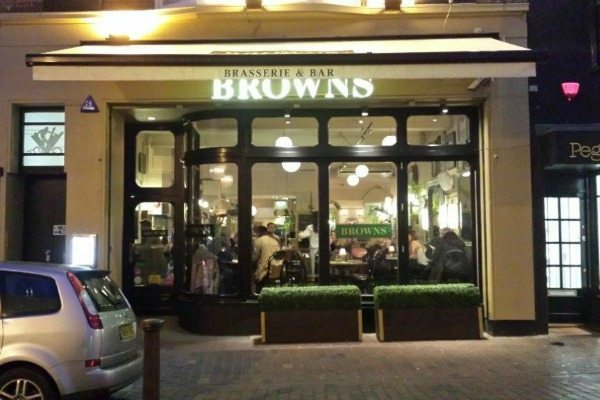 The very first Browns brasserie flung its doors wide in the heart of Brighton in 1973 and has, over the years, become a Brighton institution. The brilliant Bill Bryson even felt it worthy of an honourable mention in his travel book “Notes from a Small Island”. It is testament to its popularity and success that Browns, with its modern take on classic British cuisine, now has restaurants in nineteen cities across the country. All Browns venues are in interesting, often historic and listed buildings. The one in Brighton is no exception with the added quirk that bar and restaurant are separated by the interior design outlet Heals. 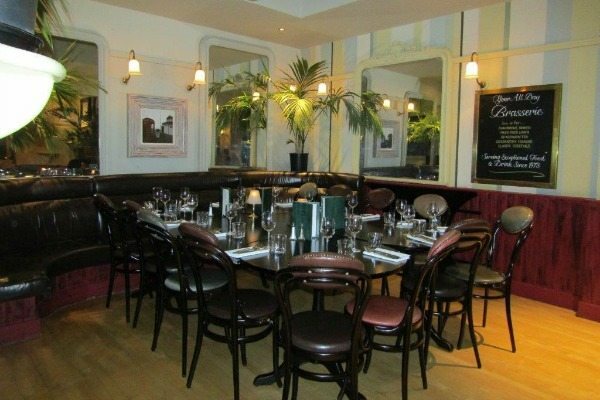 Nestled between the shopping centre and the iconic Lanes and a short walk from the theatre Royal and the cinema, Browns is perfectly located as a springboard for an evening’s entertainment or an afternoon of shopping. The restaurant looks sparkly and enticing from the outside, fronted with impressive curved floor to ceiling windows set in elegant dark wooden frames. Once inside the classy, almost Parisian vibe continues with high ceilings, complete with impressive ceiling fans, dark wooden floors and furniture and smartly-dressed bustling waiting staff. The large, well-tended plants, and, on the day we arrived, a spectacular vaseful of giant triffid-esque red flowers, add colour and vibrancy. The long bar is a thing of beauty, all polished wood, chrome and shimmering glass. The laid back ambience is accentuated by muted lighting, chilled music and the acoustics are good. Once we had settled in we ordered a bottle of Viognier, a refreshing, dry but fruity French white wine and set to perusing the options on the set menu. 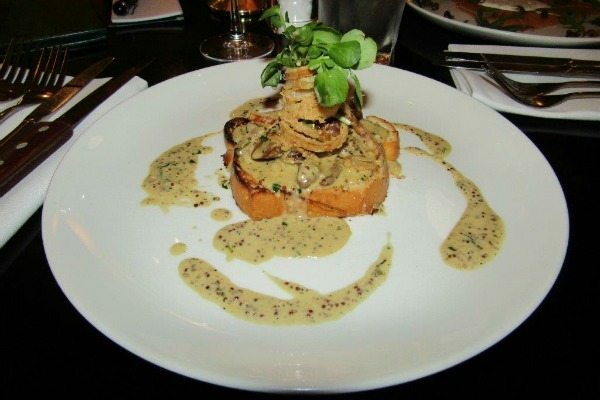 For starters Andrew opted for the chicken livers on toast with tarragon & grain mustard sauce and shallot crisps. It was pretty as a picture and tasted delish! I’m not a great fan of liver as a rule but these little livers were well-cooked, soft and moist with a delicate, slightly sweet flavour and when eaten together with the intense, rich, full-bodied, creamy sauce were quite delightful. They were served on a thick slice of griddled toast and topped with pretty, little, crispy, lightly-battered onion rings and decorated with a sprig of lamb’s lettuce. A very pleasant starter indeed and on reflection probably the star dish of the evening. 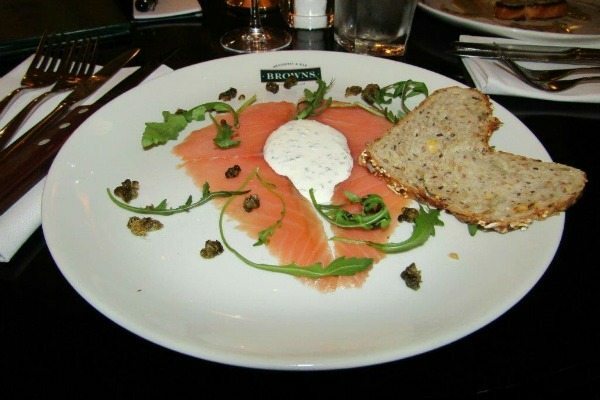 I went for the Severn & Wye smoked salmon, with lemon crème fraiche and crispy capers. I love smoked salmon, to me it is synonymous with luxury and indulgence and it was just the ticket. A beautifully thin slice of delicious, delicately-smoked salmon, with a healthy dollop of cool crème fraiche zingy with lemon. The dish was dotted with unusual, crispy, deep-fried capers and a handful of fresh rocket leaves and came with a heart-shaped slice of soft multi-grain bread. A perfect light summery starter. 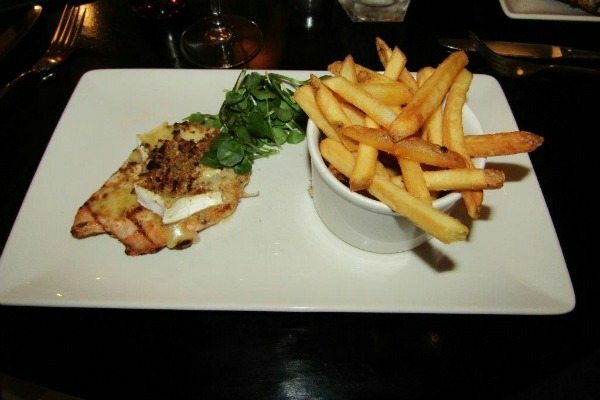 For his main course Andrew had the chicken & Somerset Brie with smoked bacon crumble and fries. It was quite a dainty piece of chicken but it was very tasty, lightly grilled and still moist and topped with a thick, melting slice of rich, oozing Brie. The bacon crumble added a subtle salty flavour and it was served with a bowl of scrummy skin-on fries. 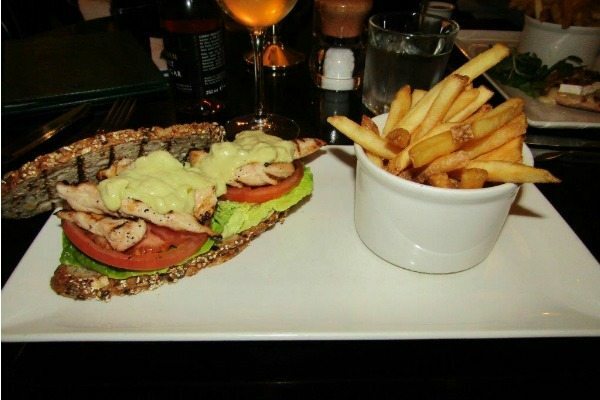 I went for the chargrilled British chicken sandwich with beef tomato, gem lettuce, mint, lemon & avocado mayonnaise and fries. The thinly-sliced rye bread was lightly griddled and the sandwich was packed with succulent pieces of chicken, big juicy slices of fresh beef tomato, crisp, fresh gem lettuce leaves and a lovely, citrusy avocado mayonnaise. 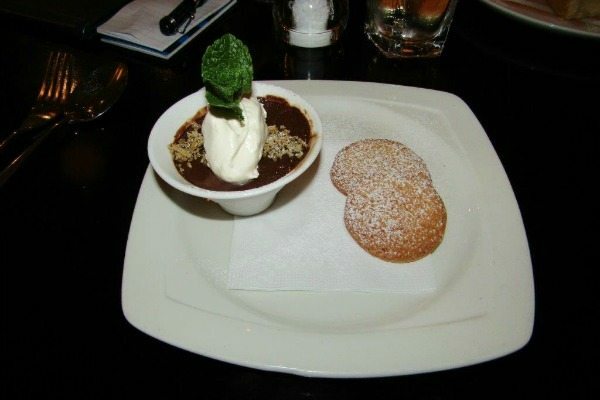 For dessert Andrew went for the chocolate pot, salted caramel hazelnut praline and shortbread biscuits. It was scrumptious. A rich, smooth, creamy chocolate dessert with a crunchy, nutty, caramel crumb. It was topped with a good dollop of cream, decorated with a sprig of fresh mint and had two sweet, crumbly, icing-sugar dusted, shortbread biscuits on the side, yum. 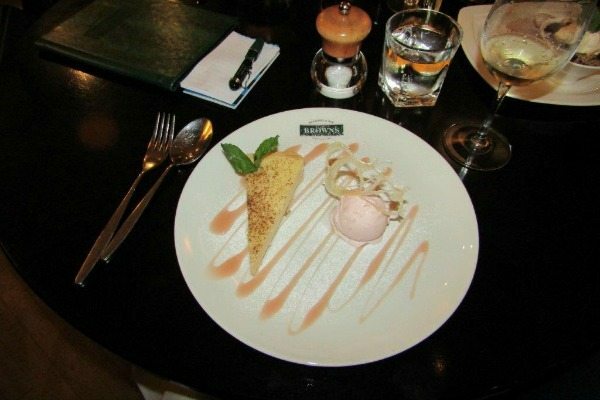 I had the enigmatically titled “rhubarb and custard”, which was a slice of custard tart, with a soft, rich, set custard filling in a sweet pastry case and a little scoop of subtly flavoured, soft, creamy rhubarb ice cream. It was all artistically drizzled with a tangy rhubarb sauce, sprinkled with icing sugar and adorned with the obligatory sprig of mint. All in all a good value light meal that will see you through your favourite play without putting you in a food coma. The set lunch/pre-theatre menu is available 12pm – 7pm and will set you back just £11.95 for two courses or £15.95 for three.